Miguel de Cervantes (or possibly not). Almost exactly four hundred and seventy years ago in the autumn of 1547, Miguel de Cervantes Saavedra was born in the small medieval city of Alcalá de Henares which lies about twenty-two miles north-east of Madrid. As a young man he served in a Spanish Navy infantry regiment but was eventually captured by Barbary pirates, resulting in five years of captivity. He later worked as a tax collector for the government. However, a tax inspection revealed that over a period of three years, there were serious discrepancies in his accounts. Without putting too fine a point on the matter, it would seem that Miguel was fiddling the books. This brought a second spell of captivity, this time in Seville’s Crown Jail. It was not a promising start to a literary career – or perhaps it was, for his time in jail and his Barbary travels might have afforded him some enlightening insights into human nature. Although Cervantes had published a novel in 1585, real success came in 1605 when the first part of his Don Quixote was published in Madrid. The second part was published ten years later and the book paved the way to its author’s recognition as the greatest writer in the Spanish language and one of the world’s great novelists. 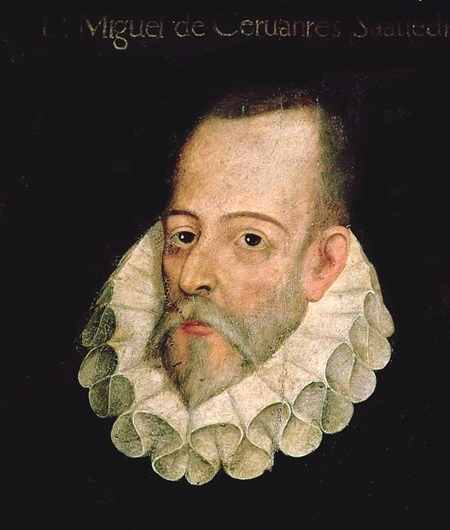 Although Don Quixote is one of Encyclopedia Britannica’s “Great Books of the Western World” we don’t know for sure what Miguel de Cervantes looked like, for there is no authenticated portrait of him. He was a contemporary of William Shakespeare and we’re not sure what he looked like either. Anyway, you will perhaps recall that the book’s central character, Don Quixote de la Mancha was inspired by thoughts of noble deeds and he was an admirer of all that which is good and great. Unfortunately reality seemed to evade him and Cervantes made it pretty clear at the outset that Don Quixote was somewhat eccentric. In today’s parlance he would be described as completely nuts. The book had a huge influence not only on other writers but also on painters and composers. There are dozens of musical works inspired by Don Quixote including ballets and operas. This seven-movement work is one of the most imaginative of all Telemann’s suites, and was drawn from his 1761 opera Don Quixote der Löwenritter. The first movement has characteristic dotted rhythms and a bustling middle section. It’s partly in the style of the French overture but then the fun begins with musical depictions of various episodes in the Don Quixote story. His misguided attack on the windmills under the impression that they are giants (at 06:58) is a spirited, bustling movement which shows Telemann at his most inventive. The sixth movement, Rosinante’s Galloping refers to Don Quixote’s ageing horse and is a charming minuet, revealing that Rosinante gallops at a rather sedate pace. The scampering last movement perhaps reflects a dream in which Don Quixote and Rosinante are racing away on yet another noble mission. The infectious music is even punctuated with several distinct horse-like sounds. Perhaps this all sounds bit quaint by today’s musical standards, but it in mid-eighteenth century Telemann’s novel musical effects would have seemed both comical and surprising. Many people must have marveled at the inventive skills of the eighty-year-old composer. Fast forward a hundred and thirty years and we come to the most successful of all the Don Quixote musical adaptations. This compelling work is virtually a double concerto for viola and cello in the form of a theme and variations. It was written in Munich in 1897 at the time when Richard Strauss was at the peak of his orchestral career with the majestic tone poems Don Juan, Macbeth, Death and Transfiguration, Till Eulenspiegel and Also sprach Zarathustra among his previous achievements. The solo cello represents Don Quixote and the solo viola as well as the tenor tuba and bass clarinet depict his companion Sancho Panza. The extraordinary invention and breath-taking orchestration places the music years ahead of its time. It’s full of humour and drama too. For some reason, for technical reasons beyond my understanding the video came to abrupt halt at 35:39. Perhaps this was due to some local problem and hopefully you will not encounter any such irritation. Incidentally, some writers like to point out that Cervantes died on exactly the same date as Shakespeare: 23rd April 1616. Paradoxically they didn’t die on the same day. This is because in Catholic Spain the Gregorian calendar was in use and it was eleven days behind the calendar used in Protestant England. That might make a good question for your next pub quiz.